This baby Giraffe Diaper Cake features a cute little giraffe cake topper, some fun accessories, colorful toys and a lot of love! 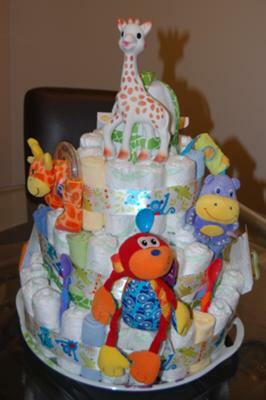 One of our wonderful readers submitter this diaper cake to share her creative ideas with our 'diaper cake community'. We love adding new ideas to our gallery and this cake is a cute addition to our ever-growing collection of diaper cakes! Thanks so much for submitting your cake! 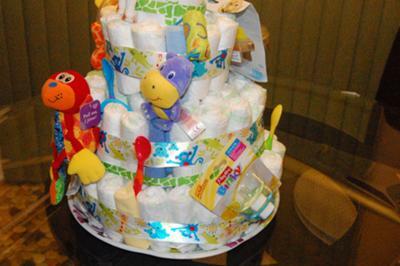 Click the link at the bottom of this page to submit your own diaper cake inspiration! The center is the diaper rash cream tubes, tied together. The center ended up a bit higher than the diaper rings, but it gave a place to tie on the giraffe toy topper. The white hair ties were used to roll each diaper, which held tight and did not show through. I tied each diaper ring with thin white ribbon, then with the thicker printed ribbon. I tucked washcloths and spoons in the rings for more color. The animals were in the front of the cake and the pacifiers, thermometer etc in the back. Since the cake would be moved around, it was wrapped with clear basket wrap and tied with giraffe print ribbon. After finding the right toys, it was fun to put together. It was for a surprise baby shower and the mom-to-be loved the cake and the whole event!